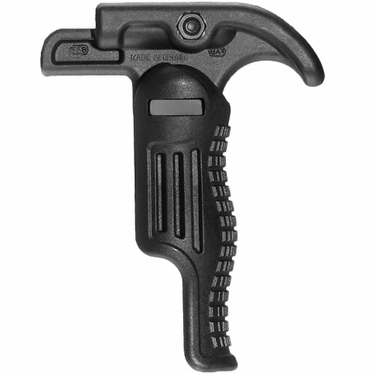 Amazing compact foregrip locks your support hand in place on the weapon. Must be used to be appreciated. Issued to Israeli Special Forces. Transforms from horizontal grip to vertical grip for different shooting applications. In the horizontal position just push grip down to lock in vertical position. Press button to fold back. Safety extension prevents hand from slipping in front of muzzle when mounted on a handgun and locks hand in position on rifles.